God, it's been a while since my last Man Day Thursday, and I'm feeling this deep park pit inside me that can only be filled with Axe body spray, TapOut muscle tees, and Under Armour boxers-briefs. What I need to fill this void is a trifecta of douches to choose from. Which one do I want to accompany home to his bachelor pad with black furniture and Asian art??? I'm spoiled for choice! 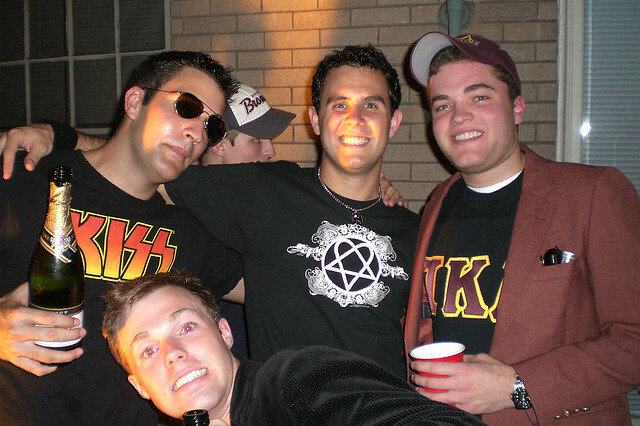 There's the Kiss shirt, the Bam Margera upside-down heart logo shirt (whether this particular logo is for Bam or that stupid Finnish band he likes is irrelevant), or the fraternity letters shirt? How can you ignore bachelor #4, with his cool black corduroy sports coat? I believe he's just finished fellating this trio whenthe picture was taken. One of these guys will eventually sell you a replacement cell-phone charger in a Radio Shack. There is something about if you're not in a cage for an MMA match, then you shouldn't be wearing any TapOut gear. I'll agree with jfruh, you can't ignore a sport coat and fraternity letters. You also can't ignore sunglasses when it's dark outside. Something about that moon being so bright! I'd take Frat Letters: looks like he has some useful "accessories" in that "breast" pocket of hos. His. Freixenet straight outta tha bottle? LIVIN' LARGE! These are obviously not examples of the Southern California Douche, who wear their hat bills flat.